The Blender Foundation, lead by Ton Roosendaal, supports the development of the Open Source 3D animation program Blender along with creative works showcasing the ability of both the program and the community of creators. Ton Roosendaal is the lead developer of the Open Source 3D animation program Blender. Blender is a highly popular platform to produce 3D renderings and is used by The History Channel and also for storyboarding the Spider-man 2 movie. Along with being the lead developer Ton is also the Chairman of the Blender Foundation, the non-profit that founds development and animation projects in the Blender Community. The Foundation is funded by donations and the sales of 3D rendering training materials from its online store. These founds allow the foundation to support Ton Roosendaal and a small staff to work on Blender development full-time, production of short films which both spur development and showcase the capabilities of Blender, and put on the Blender Conference. Ton was the original lead developer of Blender when he founded the animation studio NeoGeo in 1988. After 7 years of development it was decided that to continue improving the product it was required to perform a complete rewrite of the software. Thus, in 1995, the development for what is now known as Blender began. Ton started a spin-off of NeoGeo in 1998 called Not a Number (NaN) which had its goal to develop and distribute a powerful 3D tool for free. The business model hinged on providing commercial products and services for Blender. However, after disappointing sales results of the Blender Publisher product in 2001 the then current investors decided to shutdown the company and thus development of Blender. The Blender community, however, did not want to see such a powerful tool disappear. Ton started the Blender Foundation which negotiated with the investors to allow the releasing of the Blender source code under the GNU General Public License if they were paid a sum of 100,000 EUR. The foundation raised that amount from the support of the community and the Free Blender campaign. On Sunday October 13, 2002 the Blender source code was released to the public. The Blender Foundation has since then supported the development of the software and also the production of creative projects to showcase both the Blender software and the skilled creators in the community. In 2005 the Foundation started Project Orange to produce the Open Movie “Elephants Dream” which was greeted to wide praise. The entire project of “Elephants Dream” was released under a Creative Commons Attribution license on March 24, 2006. This included all 7 gigabytes of data which was used to create the final movie. Following the success of Project Orange the Blender Foundation began Project Peach in October of 2007 to create a “funny and furry” movie. 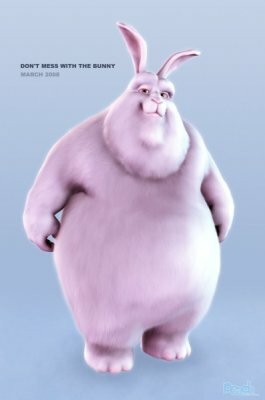 Big Buck Bunny was released on April 10, 2008 to, again, wide acclaim. An Open Game based on the Big Buck Bunny movie was started as Project Apricot in February of 2008. The entire production files of both Project Orange (Elephants Dream) and Project Peach (Big Buck Bunny) are released under the Creative Commons Attribution License. This wallpaper was made by Steren Giannini using the Big Buck Bunny characters. Bug Buck Bunny is the second open movie made at the Blender Institute. All the movie files are available under a Creative Commons Attribution license. These files are of a real professional quality, they allow many users to understand better how to make quality models and computer generated movies. This page was last edited on 12 November 2012, at 23:43.